Deliberate but pulsating, Drive is both as lean and as powerful as the machines it showcases. 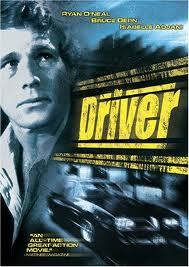 Like the cinematic icons of yesteryear, Ryan Gosling’s driver keeps his head down and his mouth closed. Whether he’s wrecking cars for Hollywood directors or eluding policemen with criminals in tow, the driver’s identity is consumed by his anonymity. One day, however, a wandering glance and a gesture of kindness introduce romantic feelings that threaten to corrode this driver’s loner stability. In the world of crime-film, as in the world of crime, I imagine, you don’t want to take up personal attachments if you’re looking to stay out of trouble. His sympathy and protectiveness lead to a more treacherous act of intended goodwill, and when things go wrong, as they tend to do, the driver finds himself knee-deep in Trouble, in possession of a large bag full of money, targeted by a utilitarian mobster, and inadvertently in danger of causing further harm to the people he initially sought to protect. From what little we know about Driver, it’s safe to assume that he would do it all over again. 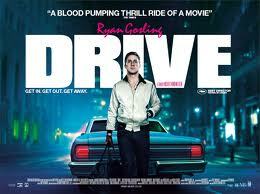 The plot points of Drive are straight out of “How to Write a Crime Film” for dummies at your local bookstore. Comparisons to Michael Mann are inevitable, justified in some ways–the lensing of Los Angeles, for one–and unfair in others, but it’s true that if you examine Drive solely on the basis of narrative events, there’s not much here that you won’t find in Thief or Heat (or The Driver starring Ryan o'Neal - Ed). Yet, the magic of Refn’s film appears precisely because of this familiarity, as it approaches genre with a skewed angle. In theory, we’ve already seen every conversation that takes place in Drive. We’ve also seen every character. And we’ve seen guys getting shot and cars being chased. In practice, however, we’ve never seen conversations, characters, or action scenes like this before. A slight shift in rhythm or nuance, an interesting line delivery or the lack of one, a literal angle that depicts violence with surprising depth: everything in Drive comes out you in a unique way and from a distinct direction. It defies all expectations even as it feeds on them. One of the foremost examples of this effect is the sparse dialogue, particularly in the case of Ryan Gosling’s character. Instead of coming across as an artsy device, the few-and-far-between moments of more than one or two sentences strung together is actually a truthful component of the portrayal. What is not said is important; what little is said is superfluous; what is shown is the most important of all. Like Refn’s Bronson, the words are as insignificant as the images are primary. In the hands of a more conventional director and more conventional actors, the screenplay would no doubt result in a clichéd mess, and expositional dialogue would no doubt be added. More than any other film in theaters right now, Drive illustrates that a master’s touch can elevate rote material from a forgettable (if enjoyable) popcorn flick to an indelible art-house crossover, from a film that you watch to a film that you experience. From Refn’s singular perspective, the framing of a shot and the movement of the camera literally tell stories of themselves. Far from merely being an element of craft to supplement the narrative, the cinematography is implicit in it. With Bronson, and now with Drive, Refn epitomizes visual storytelling, creating a palimpsest of music, color, and sound in the formation of images, both moving and still, that can only be defined by the highest compliment in this medium: cinematic. Who needs words when a slap to the face or the clench of a fist says so much more than a monologue ever could? While Bronson is as unsettling and brutish as the man at its center, Drive is as steely and confident as the man at its. The driver, beneath the swagger and professionalism, is a person with the same feelings as any other human being. For this reason, Drive has a core of warmth amid the shell of detachment. It’s chilly, no doubt, but Bronson is just disconcertingly cold, featuring nothing more than void upon void. In that film, Tom Hardy was daring in his willingness to push audiences away; in this one, Ryan Gosling is daring in the way that he allows them in, one small moment at a time. Gosling is magnetic in another towering performance: action-hero cool at the start, displaying tension in a gaze that never cowers and a body that never slacks. In the interaction with Irene and her son, he reveals hints of the vulnerable inner goof-ball that we’ve seen more explicitly in other roles. As the violence builds and the instinctual urges surface, Gosling is surprisingly, scarily intimidating, shifting to a figure of authority made even more so by the fact that he doesn’t need to raise his voice. And yet, for all the glimpses of the sociopathic and the inscrutable animalism, Driver is just a man, and Gosling is able to cleverly maximize this potential as his character’s thread of devil-may-care attitude begins to unravel. Stripped of both the pseudo-realistic (Half Nelson) and the pseudo-fantastic (Lars and the Real Girl) affectations that tend to characterize his work, perhaps too pervasively, Gosling tackles a role unlike one he has ever tackled, and he plays it in a way unlike one he has ever played. The supporting cast, including Bryan Cranston and Ron Perlman, is also in top form. Carey Mulligan is controlled and relaxed, and Albert Brooks is interestingly menacing in a role that could have turned hammy. But Gosling and especially Refn are the stars of this show. Drive is not your typical film: its single-minded muscularity might turn some off, and while I wouldn’t call it “slow,” the first act, apart from a brilliant opening sequence, takes its careful time to build-up to the carnage that will follow. Yet, viewers who generally prefer the avant-garde to the Hollywood will likely not leave disappointed. Refn tells this story with such verve, as he creates sequences that will stick in your mind long afterwards. It’s tempting to call this film slight or futile, lacking in substance and depth, and interested in nothing other than its own cool factor. But I think such criticisms are unfair: Drive is a character study of a man defined by what he does rather than what he says, and in a cinematic landscape populated by titles that rely far too heavily on exposition, I’m thankful for films that do rather than talk.